If you have any quires you can ask here. Cannot create nonunique clustered index on view '' because only unique clustered indexes are allowed. Consider creating unique clustered index instead. Cannot create nonunique clustered index on view 'dbo.view_StuInfo' because only unique clustered indexes are allowed. Consider creating unique clustered index instead. Cannot create index on view ''. It does not have a unique clustered index. Now we can create any numbers of non-clustered index on view. Cannot create index on view '' because the view is not schema bound. Cannot create index on view 'view_StuInfo' because the view is not schema bound. Since we can create an index on only those view which are schema bind with base table. Scheama bind means we cannot change the schema of the base objects unless and unill we don't remove the schema binding view or alter or drop the view. 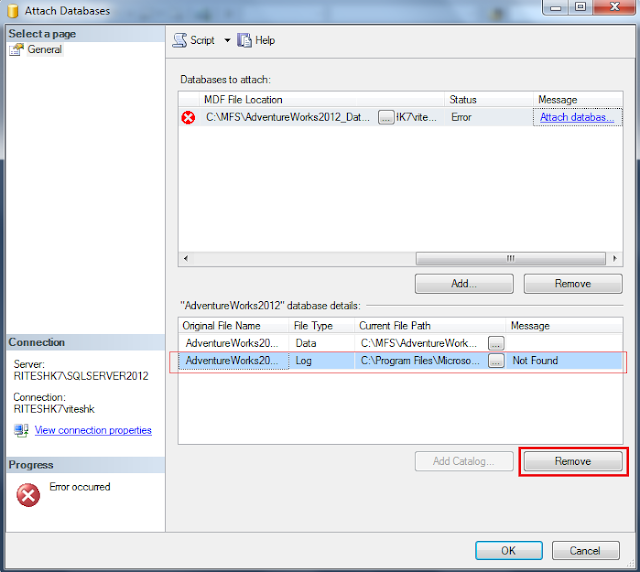 Note: It is necessay to specify the schema name (dbo) in the object. Sql script to get the input output busy time in sql server since last time sql server had started. FOR XML PATH error in column '' - '//' and leading and trailing '/' are not allowed in simple path expressions. Cause: It is due in incorrect XML path in column Location. I hope this will solve this issue.